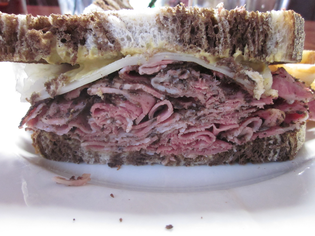 Seth Golias is a guest writer and sandwich eater for Best Corned Beef in Cleveland. He recently visited the Corned Beef Cafe and tells us about his experience. If you want to guest post on this blog, check out the guidelines here. While making my rounds at work, I spied the Corned Beef Cafe in Broadview Heights (map). Now being a lover of corned beef sandwiches, it didn't take much contemplation to decide where I was going for lunch. I walked in and promptly ordered a standard corned beef sandwich on rye with swiss to go. The staff seemed friendly and I left feeling very excited at the thought of devouring this new delicious smelling sandwich. After a drive that seemed to never end, I arrived at my office and eagerly unwrapped my lunch. The sandwich was definitely big enough, after all, a proper corned beef sandwich is not made to fit in your mouth. I must say the taste was fairly good, but I was disappointed in the quality of the meat. I prefer a more lean sandwich, one that tends to "crumble" and is not too chewy. This sandwich was a little more on the fatty side and the meat was sliced a little too thick. I think good corned beef should be sliced as thin as possible. I know many people don't agree with me, but the thickness of the slice does wonders for the texture. I personally can't say that the Corned Beef Cafe has the best corned beef in Cleveland as their window signs would suggest, but I can say that despite the opposition to my preferred style, the overall experience was agreeable. Tommy's on Coventry in Cleveland Heights is one of my family's favorites. 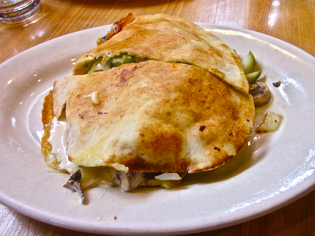 We think their food is great, the prices reasonable, the variety astounding and the service well-done. We recently had a birthday to celebrate and the birthday boy requested Tommy's. I was only too happy to oblige since I knew they had a Corned Beef sandwich (on a pita) that I was drooling to try out. It's called the Cigar and is listed to have "four ounces of corned beef with onion, mushrooms, pickles, sesame sauce, mustard and cheese". Sounds like my kind of sandwich! I'm starting to get the idea that in order to be truly great, a sandwich needs to have eight or ten ounces of Corned Beef. I'll certainly have to try that idea out in the coming months. Maybe I ask for a double Cigar next time?! Until then, if you're wanting to try something satisfying, tasty and delicious with a different presentation, certainly consider Tommy's! They're even on Twitter! And make certain you save room for one of a shake or malt. Moosetracks is awesome. 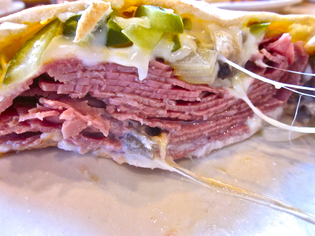 So what's your favorite Best Corned Beef in Cleveland?